According to IMF’s Currency Composition of Official Foreign Exchange Reserves (COFER) database, US dollar remains the preferred reserve currency. In the fourth quarter of 2011, the dollar made up 62.1% of official reserves. 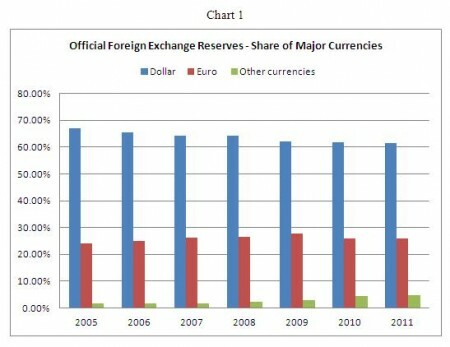 The dollar accounted for 61.4% of official reserves in 2011 vs. 61.8% in 2010 and 62% in 2009. US House passed a currency bill by a wide margin, 348-79, yesterday to penalize China’s foreign-exchange practices. The measure would allow, but not require, the U.S. to levy tariffs on countries that undervalue their currencies, which makes their goods cheaper relative to American products. This is a highly politically-charged bill, right before the US’ mid-term election. With high unemployment rate of nearly 10% at home, blaming foreigners for one’s own backyard problem has always been the easiest solution for politicians in the past. 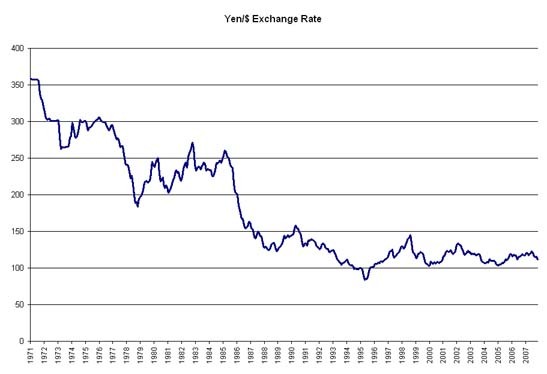 As I have done many analysis before, currency is not the the solution to America’s trade deficit problem, Japan’s experience back in 1980s is the best example. Neither it’s the solution for the unemployment problem. The high unemployment rate was created by the most severe recession since WWII, and by the huge bubble in housing market. Simple economics will tell when China’s exports become more expensive, US importers will, sooner or later, choose to import from other developing countries, whose exports will become cheaper and more competitive than China. This is the so-called substitution effect. In the end, China’s trade surplus will shrink with the US, but US’ overall trade deficit will not budge. To solve the trade deficit problem, US consumers really need to save more, or consume less. 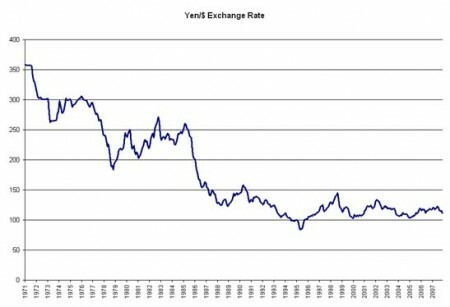 The savings rate has already been rapidly increasing in the past couple of years. Sounds painful, but this is a process the US economy has to go through. Yesterday’s spendthrift means today’s frugality. And by the way, who will get hurt most by the import tariff? The US consumers. What about China? China should stop subsidizing exports through lower currency or tax rebate. Subsidizing exports is essentially shifting Chinese tax payer’s money and put it into American consumers’ pockets. Good deal for America; bad deal for China. The export subsidy will also distort resources allocation according to price signals, resulting in too much capital invested in the low-end export industry, with poor capital return. I said above Yuan’s appreciation will shrink US trade deficit with China, but US total trade balance with the world won’t change much because of substitution effect. Now looking at the the following two charts I’ve just made, I even doubt that Yuan’s appreciation will shrink US-China trade deficit. The first chart shows the cumulative trade deficit of US with China (in red), and Yuan-Dollar exchange rate (in black) from 2000 to 2009. 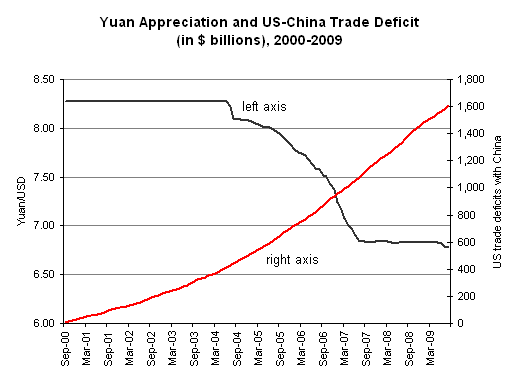 Yuan had depreciated by almost 17% from 2004 to 2007, but the US trade deficits with China just kept soaring. Yuan’s appreciation did not solve the problem. The second graph shows a similar story. The difference with the first chart is now I show the monthly trade deficits (not cumulative, in red). 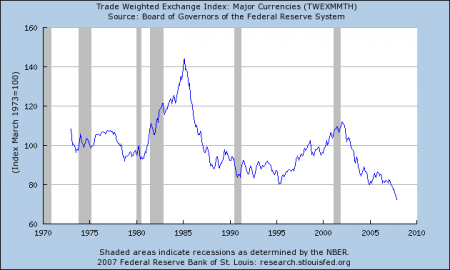 The blue line shows the 12-month moving average of the monthly number. 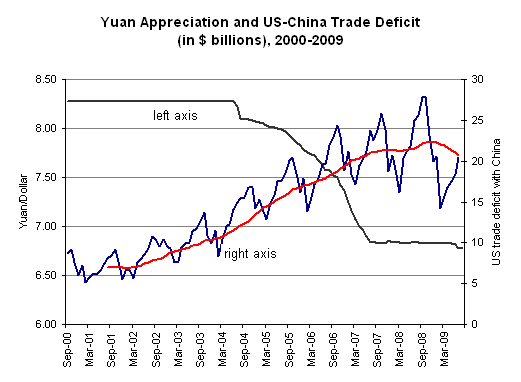 The trend was clearly upward despite Yuan’s 17% appreciation during 2004-2007. Again, currency appreciation did not solve the US trade deficit problem, and it just kept growing, only until the recent recession hit, it started to trend downward. My educated guess is that, because Chinese price is so low, even with currency appreciation and higher goods prices than before, the demand for such goods did not decrease much. In other words, American consumers may have a quite inelastic demand curve for Chinese goods. After all, majority of Chinese exports are necessity goods, not the durables, nor the luxuries. 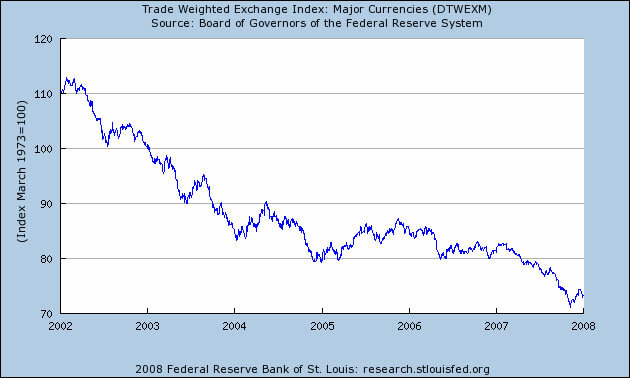 Euro reached its lowest level against US dollar since April 2009, now trading below 1.30 $/euro. Looks like the market is not happy about the huge costly Greece rescue plan put out by Germany-led EU and IMF. 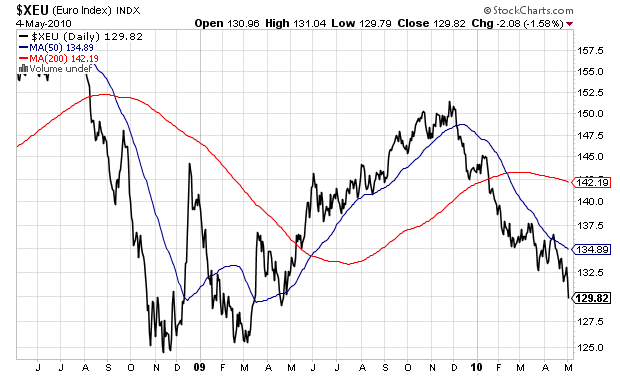 We are also seeing signs of contagion, to Portugal and Spain…now let’s see if the Euro can hold at 1.25 level. If not, Euro will have a real problem.